This game is very good, very fun, but what I have encountered recently is the issue that I can’t gain trophies. Part of this issue is that I’m a th8 getting three stared by th9 and losing 30 trophies. 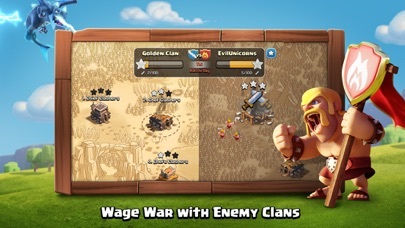 The other issue is that whenever i try to attack someone with one of my attacks that has no air troops, some players will have max balloons from their CC and destroy my attack losing me 30 trophies. Also, I am only gaining around 10-15 trophies per attack which is really annoying considering my opponents gain 30. 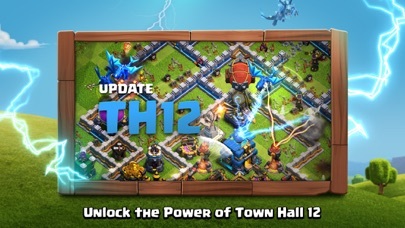 What I have also been seeing is that there are a lot of bad players on th8,9, and 7 have been gaining trophies because of the th12 in their clan donating them max troops. 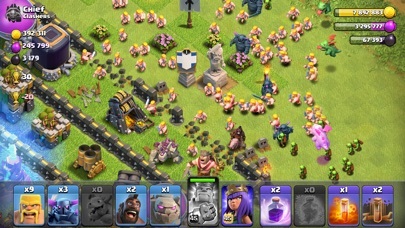 This Is unfair for players like me who doesn’t have th12 max troops to be donated to me. 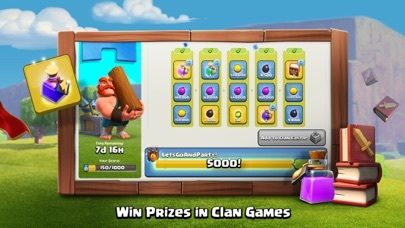 I say if you remove CC troops on regular defense, I am fine with them in wars, it would make the game more fair and balanced. I just came back to write another review and look, I found a different one I wrote. What I am now saying is that I now am th9 and am getting 3 starred by th10. But here is the issue, some people have been playing me and in their CC they have a max siege machine and max troops which is obviously unfair for a th9. Also, I found a th10 base which I attacked and guess what came out of the CC. It was air troops when I had an all ground attack and I ended up losing the attack. I was right next to the town hall and I got melted. 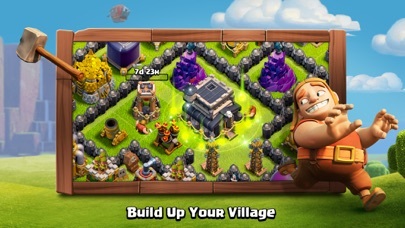 So my recommendation is to first of all only offer bases that are max or close to max of the town hall below. I am not near max and am getting attacked by th10, most of which are close to max. Also, if you have ground CC, match them up with players that have ground troops. Same goes for air. If you have air and they have ground CC, the CC will get melted unfairly. If you have ground troops, which I do since I use valks, they get melted by dragons and sometimes E dragons. Also, if you have no CC, match the person with no CC with a guy who has no CC. This game is fun, but If you aren’t almost max th12 or have a th12 in ur clan that gives you max troops, it will probably be extremely unfair at times, and if you are unlucky like me, quite a few times. It’s a good game and it’s fun to play but on the attack’s we need more time because every single time I attack I only get 99% so you should give us more time. If you don’t all of my attacks are just getting me that much closer to deleting the game. Thank you. I re-downloaded this and quickly realized why I quit, it’s a fun app but the troops are horribly programmed. They’re suppose to go after the closest thing to them but troops like dragons and archers go after something on the other side of a wall a mile away or even just a tile farther than the object they’re suppose to attack. It’s really annoying and I’ve lost a lot of trophies because of it. I do recommend getting he game but I’d like this issue fixed. 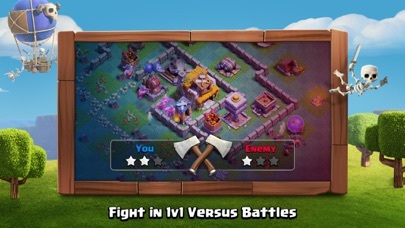 This game is one of the best games I’ve played but it’s just that you don’t have enough time to attack bases during clan wars, like you’re about to do a 3 star but there’s not enough time! I mean come on I just needed 10 seconds more and it’s a 3 star attack and if you did not have those 3 stars imagine that your clan loses because of you. And also the game has a lot of bugs like on loading page you could stay there during hours and hours doing nothing. But without those commentaries I really recommend playing this game it is really entertaining. So don’t doubt downloading it you won’t regret it. Great game execpt for that I was upgrading one of my building to a really high level that takes 3 DAYS and I acdently hit cancel at 10 hours left so I contacted super cell Id but they just said sorry that’s unfair to other players. My only complaint is it’s becoming too much like fortnite and having passes and skins, but otherwise most stuff in the game is fine. AI can usually only be slightly less intelligent than the person programming it. In this case, AI is twice as smart as the group of people programming it. Prepare to play with the absolutely dumbest AI you've ever encountered. Oh, and if dupercell takes their own advice and makes emotes for this game that make it as horrible to play as clash royale, it only shows how void the space in their brains really is (a few more bad ideas and a black hole is going to open in Helsinki). If you're going to continue along this juvenile emote track, every emote/message should only be positive. No crying, no laughing, no angry faces, no picking noses, no arm farts, etc, etc (crash royale is muted 24/7 because of your lame attempts of pitting everyone in the world against each other). It's not cool to bully other people and you're pointedly trying to make it easy for immature people to do that. Bad form.